So, today I've got a little update on my Invisalign journey. Week #1 day 1 & 2: Mouth extremely dry and sore inner lips caused by the attachments every time I had to eat and talked without the trays on. Broke the first attachment on the second day of wearing Invisalign. Apparently, Invisalign does not check if the position of the attachments could lead to conflict while biting/eating. Week #1 day 1-4: Removing the aligners feels like you are pulling all your teeth out but it doesn't hurt. Day 2 of set#2 was the first time I felt pain. My teeth were sore, specially the lower ones. Couldn't bite on food but after 1 paracetamol, all got fine. From that point on, everything smooth! 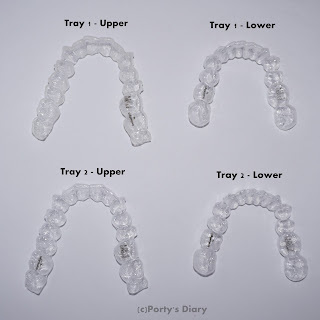 As time goes by, the aligners are not super tight anymore and it's a lot easier to remove/put them back in. Even though I thought my speech had changed, it seems that nobody notices anything. I also thought that everyone could notice my attachments and braces while talking but I was wrong! And yes, I do have some attachments on my front teeth (not the middle ones). To keep them clean, I use a baby tooth brush (it reaches the smaller places much easier than an adult brush) and a bit of tooth paste. Nothing fancy but I haven't noticed any coloration so far. I'm just following the instructions that came with the Starter Kit. I knew what I was getting into but brushing my teeth&aligners every single time I eat (which reduced from 6 to 4 times/day) is a bit annoying! Do it on public restrooms becomes even more awkward. You get funny looks but nobody says a word (so far...). And yeah, say good bye to unexpected snacking/drinking. Everything has to be planed. On the other hand, I try to keep it as relaxed as possible, as I don't want to be a "slave" of these braces. As long as I carry my "cleaning kit" everywhere, all is fine. While wearing the aligners, I just can't bite my lips (you know... remove dry patches... I know it's not good!) or nails! So, finally, they are slowly getting back to a much better size and shape. I honestly do not see a major difference between set 1 and 2, but if there's something I can point out is the slightly movement of my two front upper teeth. Soon, I will come back with more info/updates. I don't know the answer to your question because I did not try traditional braces. Best option is to sit with your ortho, and talk through your treatment and see which option is best for you and your expectations.